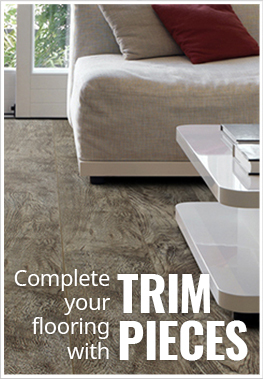 Description - TimberCore is a brand new and revolutionary wood floor option that is 100% water resistant. Unlike traditional and cheap laminate flooring that can absorb water and swell, TimberCore is specially constructed to be durable, and is even approved for use in high traffic commercial areas. Safe for installation anywhere in the home, TimberCore is backed by a 25 year residential and 10 year commercial warranty. Material – 100% water-resistant casing with premium pressed real poplar wood board (not MDF or HDF), nuClick interlocking system, laser printed wood look design layer, and an aluminum oxide wear resistant top layer. Size – 6.75" x 47.75"
Class Rating – AC5 (Designed for heavy foot traffic areas and can meets commercial standards). Weight – Each laminate plank weighs ~4.5 lbs. Recommended Uses – Since TimberCore products are 100% water resistant, it can be installed virtually anywhere. Basements, bedrooms, bathrooms, kitchens, entryways, offices, waiting rooms, retail shops, and other commercial spaces are just a few places where this water-resistant wood plank is recommended. Use a damp cloth to blot up spills as soon as they happen. Never allow liquids to stand on your floor. For tough spots, such as oil, paint, markers, lipstick, ink, or tar, use acetone/nail polish remover on a clean white cloth, then wipe the area with a damp cloth to remove any remaining residue. Sweep, dust, or vacuum the floor regularly with the hard floor attachment to prevent accumulation of dirt and grit that can scratch or dull the floor finish. Do not wash or wet mop the floor with soap, water, oil-soap detergent, or any other liquid cleaning material. This could cause swelling, warping, delamination, and joint-line seperation, and void the warranty. Do not use steel wool, abrasive cleaners, or strong ammoniated or chlorinated type cleaners. Place door mats at all entrances to prevent tracked in dirt, rocks, moisture, and other debris. For further maintenance information, please Click Here. For printable installation information, please Click Here. Resistant to stains, fading, scratches and are anti-slip. Flawless stability even over imperfect surfaces. 25 year home warranty, 10 year commercial warranty.